Philanthropic support for education has a long history in the United States, beginning with the founding of institutions of higher education and pre-dating the creation of the public education system as we know it. Over time, the focus of private giving to support education has evolved from an early focus on teacher’s colleges to now include direct support for schools and students as well as for education reform models. Education, including both K-12 and higher education, is one of the most popular areas for philanthropic funding, receiving roughly one-quarter of total giving and trading off with health-related giving for the greatest share of philanthropic dollars. Approximately 40 percent of education giving goes to support K-12 education, equaling about $1.8 billion given to K-12 education in 2012. Although education-related giving accounts for a significant share of philanthropic giving, philanthropic funds amount to less than 1 percent of total public K-12 funding, which poses a challenge for foundations seeking to effect systemic change in public education. Historical data on grantmaking suggests that most grants in education support the “status quo” by providing additional support for activities in which public schools already engage. But recent trends in education philanthropy suggest that a greater emphasis on change-oriented activities may be emerging. Some of the rise of this approach to philanthropic investment is certainly due to trends among funders. Namely, the emergence of several relative newcomers to education philanthropy who focus investments in specific issue areas and apply data-driven business principles for investment, including the Bill & Melinda Gates Foundation and the Walton Family Foundation, has influenced the nature of education-related giving. Foundation support for education (inclusive of both K-12 and higher education) comprises between 21 and 25 percent of total giving over the past 10 years, comparable only with health-related causes in the share of total giving (Figure 1). Source: The Foundation Center, 2015. Based on all grants of $10,000 or more awarded by a national sample of larger U.S. foundations. For community foundations, only discretionary grants are included. Grants to individuals are not included in the file. In 2012, funders provided $1.8 billion for K-12 education-related grants. Total K-12 giving has grown each year over the past 10 years by an average of 7 percent annually (Figure 2). Though $1.8 billion is a substantial sum, in the context of public spending for public education, it’s a relative drop in the bucket — amounting to less than three-tenths of 1 percent of total spending on public education nationally. Further, that $1.8 billion includes giving for all K-12 education-related grants — public and private, domestic and foreign — so the total amount specifically supporting public education in the United States is less. Examining the top recipients of K-12 education-related philanthropy in 2012 (most recent year available) provides a snapshot of funders’ recent priorities. The top 100 recipients represent the individual organizations or institutions receiving the largest share of philanthropic funding (from a single or multiple sources) within K-12 education giving. Funding to the top 100 comprises a little less than 40 percent of the total giving for K-12 education in 2012. About 11 percent of that funding supports private schools, either through direct support to individual schools or through tuition scholarships. Collectively, support for charter schools, either through funding for charter management organizations or organizations that support charter schools or the charter school movement, accounts for the largest share of funding to the top 100 recipients at about 24 percent. About 17 percent goes to organizations that support human capital in schools — either by supporting teacher quality or school leadership capacity. The top recipient overall is Teach For America, which alone accounts for about $58 million or about 8 percent of the total allocated to the top 100. Nearly 20 percent supports organizations that engage primarily in advocacy and research. And another 16 percent of the top 100 recipients’ share goes to direct support for state departments of education, districts, schools, and classroom activities through direct grants and district foundations. The remaining 20 percent is allocated among recipients focused on direct family engagement, content development and delivery, and various other purposes. Figure 3 shows the top 25 recipients in 2012. These data represent less than half of total giving to K-12 purposes in a single year, and as such they cannot point to conclusions about general trends in the type of activities funded overall. However, they suggest that significant philanthropic resources are being devoted to organizations with missions that aim more toward innovation and reform. For instance, investment in charter schools can redirect the use of public funds to more innovative approaches by changing the institutions through which public funds flow. Capacity-building activities around teacher quality and school leadership could also be viewed as systemic change-oriented strategies if they increase the market share of high-quality personnel and leadership capacity available to public schools. Shifting to data on the most active funders in K-12 education, immediately apparent from the list of top funders in 2012 is the presence of relative newcomers to the education grantmaking space (Figure 4). The top two K-12 education funders are the Bill & Melinda Gates Foundation and the Walton Family Foundation. 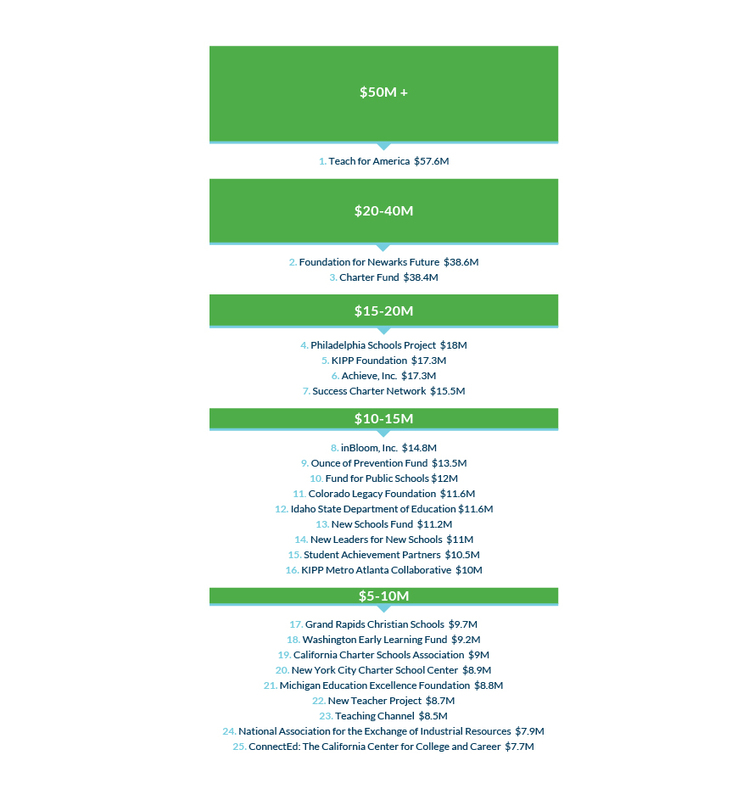 Together, these two foundations funded nearly 20 percent of total K-12 education giving in 2012, and they have occupied top spots for overall education giving (K-12 and higher education included) for at least the last 10 years. 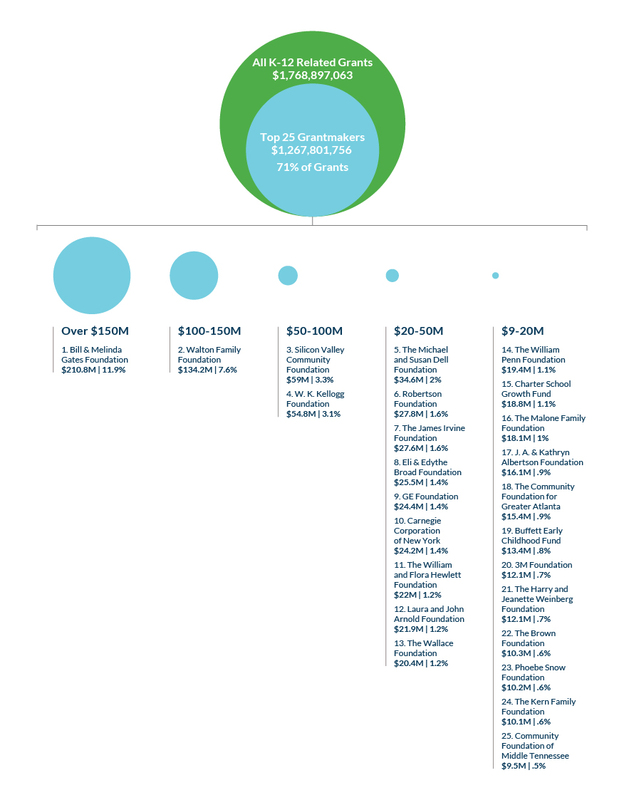 The rest of the top 100 funders in 2012 comprise almost 53 percent of total K-12 giving. This means that 100 funders make almost three-quarters of grants for K-12 education-related purposes. The Bill & Melinda Gates Foundation focuses its education giving in the United States primarily on activities supporting college readiness. The Walton Family Foundation’s primary K-12 focus is on supporting school choice through a range of models, including the charter sector. These issue priorities and the relative share of funding flowing from these two entities inform the types of organizations that rise to the top lists of recipients. Several aspects of the Gates Foundation’s history and approach serve as examples both of a shift in the nature of education giving over the last decade and of some strategies for public education investment. That said, no rigid lines exist between traditional funders and newcomers in the types of grants awarded. And the “venture philanthropy” principles are not the sole purview of the new guard — any funder can employ strategic investment with a guiding vision, clear expectations for grantees including measurable outcomes and accountability, and a clear articulation of the desired scale and nature of impact. And in particular, requirements that grantees define specific measurable outcomes and track progress are increasingly common among venture and traditional funders. The sheer magnitude of the public education system poses a challenge for the philanthropic community, particularly if the desired goal is large-scale change. With even the largest private funding efforts amounting to a very small expenditure relative to public spending, achieving systemic impact requires changing the way public dollars are spent. However, historically, the majority of public education giving has supported the status quo — providing additional funding in support of activities in which schools already engage or could engage in if they chose. This type of approach, though certainly valuable to grantees, is unlikely to have systemic influence if change is the ultimate goal. And absent an influx of new or redirected public dollars for continued support, even the most promising and innovative grant-funded activities are unlikely to persist beyond the period of the grant. Informing and influencing the public policy debate. The first approach involves creating and supporting new types of public schools and school governance models. An analysis of a subset of 2013 grants from 15 of the largest funders in K-12 education shows that among higher-leverage grants (which still make up the minority of K-12 grants overall), grants to charter schools comprise the largest share. Charter schools, which create an alternative to the traditional school model and shift the structure of the public institutions through which public dollars flow, can also generate their own advocates in the communities they serve. Because of both the leveraging of public dollars and the potential for advocates independent of the private funder, the impact of such an investment is likely more sustainable with a greater potential for systemic influence.6 This example is not meant to hold up charter schools as a particular model, but rather to provide an example of one means of steering the use of public dollars. But active engagement from a few high-profile foundation leaders does not fully explain the trend. Survey data from Grantmakers for Education indicates that nearly 60 percent of their members surveyed included investment in influencing public policy as part of their strategy. Engagement in public policy takes a variety of forms, with investment in policy advocacy topping the list of popular strategies for investment, followed by research and analysis, and coalition building (Figure 5). Both the “venture philanthropy” approach and the increased profile of funders in the public policy arena have generated some criticism. Commonly cited concerns include the potential for outsized influence of big money donors on the policy process relative to more traditional voices in public education debates, such as teachers and other education practitioners. Some of these criticisms have been highlighted in political backlash against the Common Core State Standards, for example.11 Additionally, some critics argue that investments that significantly alter public institutions can create sustainability issues if funders’ priorities shift and private support is withdrawn. One example of this is the Bill & Melinda Gates Foundation’s withdrawal from its small schools investments, which left districts with the burden of funding schools that were more expensive to run based on economies of scale. The body of research on the influence of philanthropy on K-12 education is not large, nor is the body of data on giving comprehensive or easily accessible. What can be gleaned from available research and data is that patterns of giving have shifted in recent decades to include more efforts to fund disruptive or innovative approaches, signaling a belief among funders that problems in K-12 education are not solely an issue of a lack of resources but also of a need to use existing resources differently. Increased reliance on data and “results-driven” philanthropic investment that create proof points for promising practices are hallmarks of some of the most prominent philanthropic efforts of late, as well as increased investment in research and advocacy efforts that can build knowledge, capacity, and political will to replicate proven models. Whether the application of “venture philanthropy” principles will have large-scale impact on public education as a whole remains to be seen, but what is clear is that funders can be strategic by clearly defining measurable objectives, building in accountability into grantmaking, and considering ways to scale impact (i.e., through research and advocacy) and sustainability.